In this article, I would like to show how our Total Krav Maga home study course (DVD, streaming, or online subscription) stacks up against the competition. When developing the Total Krav Maga program, we wanted to create the world’s best way to learn Krav Maga at home. This unique mission led us to creating a very well rounded course of study, and here, we will highlight the major differences and features that are included in Total Krav Maga. First off, our course is instructed and organized by certification levels (like belt levels), to make your training journey much easier to follow. 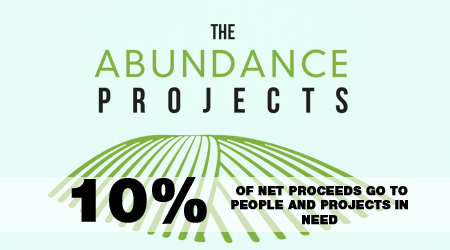 Each level is learned in a sequential manner, which allows you to constantly build and rehash your foundation. We are one of the only programs in the world that give you the opportunity to earn real accredited rank at home, through our video testing process (I’ll get to that in a second). So, if you are training with us to earn real rank, and/or to become a certified instructor through our association, the rank requirement syllabus will show you a clear path. 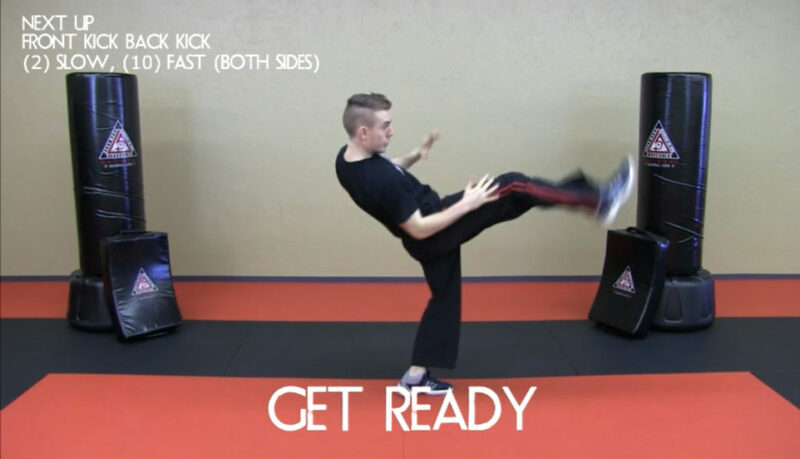 The techniques are well indexed and easy to find, whether on our DVDs, in the streaming edition, or on the Global Martial Arts University student subscription. Black Belt at Home was founded back in 2008, and over the past decade, we have been constantly improving and raising our standards for our distance training students. We pioneered a unique video testing system, with an instructor feedback loop, which allows for our students to test and receive constructive corrections and guidance. Some online martial arts programs have caught a lot of criticism for having low testing standards, and are sometimes called belt factories. We have changed this. We expect our home study students to not only be at the same standard as students who train in person at our local schools, but even higher. It takes a lot of self discipline to follow along with our videos, train with 100% intensity with your partner, religiously update your student journal, and prepare for a rank exam (all without an instructor standing next to you). We have many students from around the world who are successfully earning rank and moving forward with us. After submitting your video rank exam, one of our instructors will do a complete, detailed grading, and film a personal feedback video for you. These feedback videos are so valuable, and helpful for your constant progress. You will not earn your official rank certification, unless you have passed the requirements, and met the proper standards via your exam grade. The black belt exam must be taken in person at one of our official testing centers. 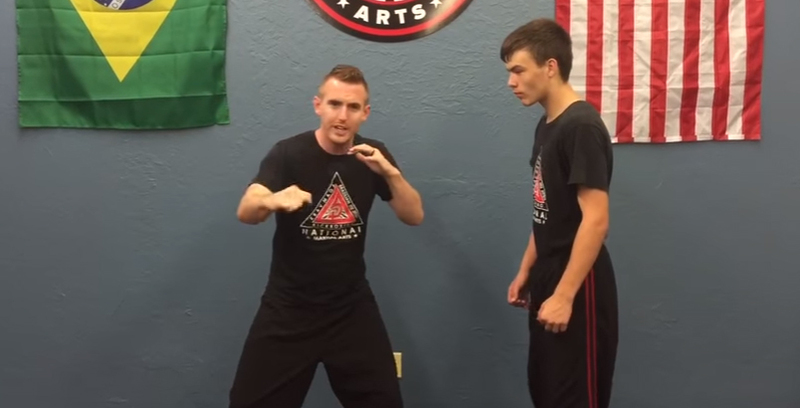 Why do people pay $100+ a month to attend local in person Krav Maga classes? There are many reasons: to learn from a knowledgeable instructor, be with friends, encouraging support, live practice with equipment and partners, changing up drills, having a coach motivate and push you, and being guided through a class/workout without having to think about what to do next. 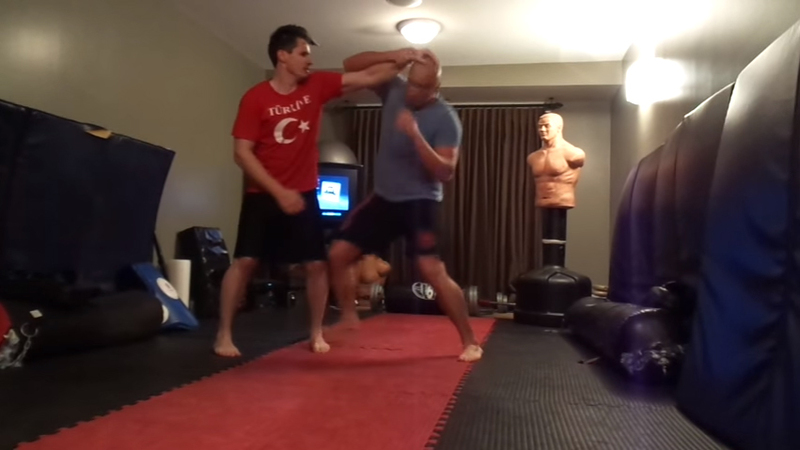 What if you could attend a real Krav Maga class at home, whenever it is convenient for your schedule? 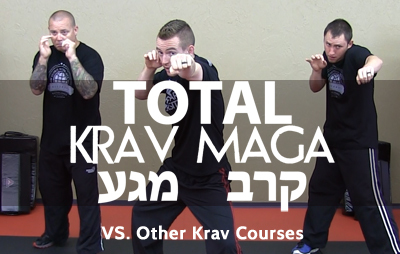 Our new GMAU Total Krav Maga course includes a full collection of sequential, follow along classes that will push you, make you sweat, drill you, and teach you Krav in a very natural class setting. Level 1 includes 24 follow along classes, which you can do in order. Each class is about 30-40 minutes long, with no down time (a few rest periods here and there, but no surfing on your phone in between drills). The odd number classes are “Lesson Classes” which teach you the new techniques with high level and comprehensive explanations, along with some movement and basic drills. The even number classes are “Drill Classes” which will take you through unique, fun, and challenging drills which can be done with very little equipment, often with simple household items like couch cushions, chairs, or pillows. Each week, a new class releases. There will be a complete set of classes for every level, so you can follow an exact training path from white belt to black belt. These classes are best done with a partner, and can also be done with a small group of 4-8 people if you’d like. If you need to do some classes solo, that is fine, but a (good) partner will allow for the best and most realistic style of practice. The Total Krav Maga DVD or streaming edition also includes a group of follow along classes for a well rounded training regimen. Another simple, yet powerful innovation within the Total Krav Maga course: The Krav Maga Workout. The Krav Maga Workout is an exercise routine which will get you in the best shape of your life, all while embedding the life-saving krav techniques into your muscle memory! 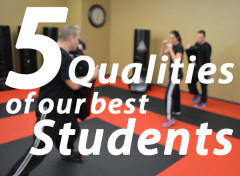 It is like a fitness kickboxing class mixed with HIIT, but rather than doing kickboxing, you workout with the actual krav techniques from our ranking syllabus. 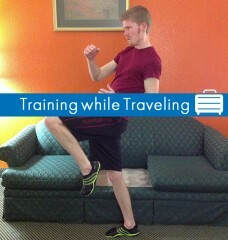 The Total Krav Maga course includes some of these workouts for you to put into your training schedule. Krav Maga is a very fitness oriented martial art. Well, every martial art has some fitness benefits, but Krav, due to its explosive and fast-paced nature, gives your body an outstanding cardio workout. Our course also includes flexibility routines, which can be done in the morning or evening, to increase your range of motion and elongate your muscles. The goal is not just to lose weight, or build muscle, or be able to make a human pretzel, but to have a very healthy and active lifestyle through our training course. Essentially, the goal for our students is to be fit in a balanced way. This is a huge difference between our course and others. When you enroll as a student, you have the benefit of instructor support and guidance. If you have a question about a technique, need some help setting up your training schedule, are wondering about a piece of equipment, or just need some motivation, your instructors will be there for you. 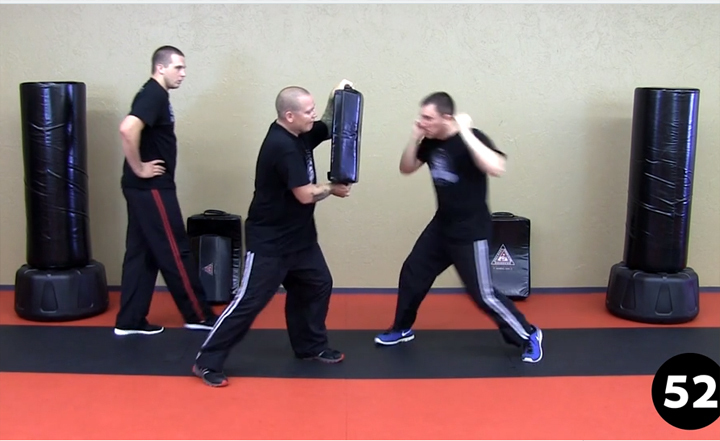 Michael South and Dustin Koppel are the black belt head instructors of the Total Krav Maga course. They both run their own martial arts schools, and are still active students (and competitors) themselves. As students, they understand how important it is for you to comprehend how to do techniques properly, and to be corrected. As instructors, they want to see you push yourself past your limits, and truly master the material. You can film yourself and submit a quick video for your instructor to review, or ask a question. Our instructors are not judgmental, rude, biased, or egotistical; they are here to serve you on your training journey and growth. 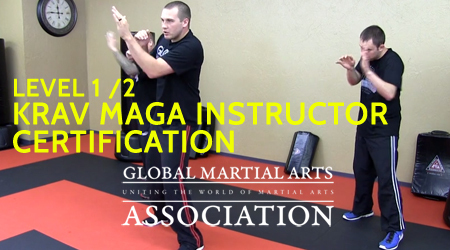 You also have to opportunity to become a certified instructor through the Krav Maga branch of the Global Martial Arts Association. If you hold a brown belt or above in a different martial arts style, and are above the age of 18, you are eligible to begin the instructor process. If you live in the United States, we recommend that you attend one of our in person 2 Day Instructor Certification events. These are small group events, where you will learn from one of our black belt instructors, and train with a group of peers. Not only will you review the physical techniques, but you will learn how to be an instructor. Class management, voice fluctuation, formations, praising, correcting, stretching, class planning, testing, marketing, sales, program management, and much more will be covered in the instructor certification course. If you are not able to travel to the United States for an in person event, we have an online, one-on-one program which you can do. This is a mix of video lessons, skype calls/live video meetings, and written materials which you will study. You will then need to take your final physical and teaching test in person, at one of our official testing centers. We currently have two in the US, one in Italy, and are in the accrediting process with a location in South America and the UK. We do not charge a monthly licensing fee, yearly dues, or outrageously high costs to become an instructor in our association. Our certification is affordably priced, but still gives you all of the knowledge, experience, and backing that you need to open a legitimate and successful krav maga program in your own school. Total Krav Maga does not only include world-class, high level video instruction of life-saving Israeli Krav Maga techniques, but many more home study training tools to help you make consistent progress toward your ultimate goal. The Total Krav Maga Home Study Course is available as a DVD set, a streaming/download edition, or the full Global Martial Arts University student subscription. We understand that some students prefer to watch DVDs, and others like being able to access anything on the go. I hope that this article did a good job of highlighting some of the unique features that set our course apart from “the competition.” There are other viable options for learning krav maga at home, and I can only recommend that you use your best judgment when choosing the course, organization, and instructor that will help you reach your training goals. 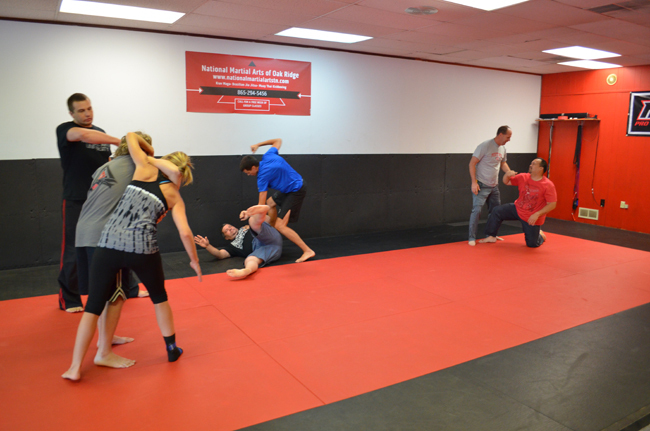 Other krav maga courses are instructed by experienced instructors, have well organized curricula, great in person training events, and should be considered as well. If you choose Total Krav Maga, we look forward to training with you soon and seeing you grow with us! On the main page select the Student Area menu tab. In the student area select the My Journal tab in the left top corner. 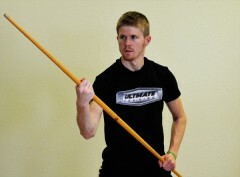 Our Ultimate Training instructional videos are specially designed to help you learn each technique, form, movement, and stance at a deep level. [Like if you were in class with an instructor!] Techniques are explained, demonstrated from angles, and shown at full speed for a holistic understanding. 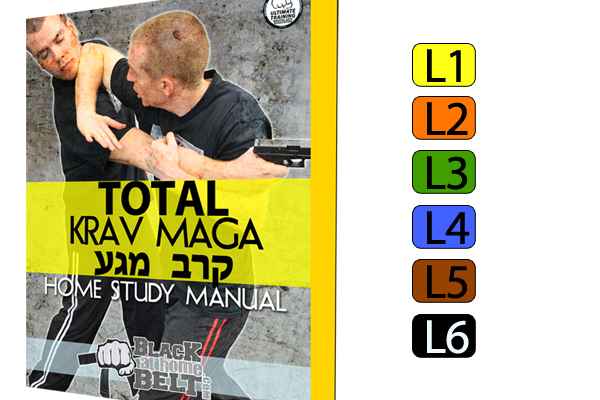 Included in every Black Belt at Home Course is a Student Training Guide, which has the complete belt-by-belt syllabus. You can review the rank requirements, and make an easy to follow path for your home training. There is no SET date for completing each rank level and taking a rank exam. You can begin with a Black Belt at Home Course, and once you are ready, enroll as an official GMAU student. You can then rank as fast or as slow as you want, depending on the intensity of your training schedule. If you enroll into the GMAU student membership, you will have an instructor in your corner. If you have questions or need something to be reviewed, just ask your instructor. And, after taking a rank exam, you will receive a personalized feedback video to keep you on the path of improvement. On our blog, you will find articles and videos that are designed to help you in your at home training experience. Articles such as: ‘5 VITAL Resources for a Home Study Student’, ‘How to Be a Successful Home Study Student’, and more will help you stay on track. Since 2008, we have enrolled students from over 40 different countries. We ship our DVDs worldwide, and of course, streaming videos can be watched instantly. We look forward to having you train with us, wherever you are from! ©2019 Hodgy LLC. All rights reserved.